Soprano singer, Elizabeth Olaitan, accompanied by Tosin Ajayi on the piano, as they perform works by Professor Akin Euba during the concert at MUSON Centre, Onikan, Lagos. The Musical Society of Nigeria, in partnership with Friends of Akin Euba and University of Lagos, last Thursday, January 17, hosted a concert in honour of the renowned composer and musicologist, Prof. Akin Euba. Sponsored by MUSON and the University of Lagos, the concert was part of a series of events lined up to celebrate the works of Akin Euba and highlight his contributions to the development of modern composition in Africa. The concert showcased some of Nigeria’s top performers of art music, including pianists, singers, conductors and choral groups. It featured the music of Euba, as well as the works of other Nigerian composers, including, Thomas King Ekundayo (TKE) Phillips, Okechukwu Ndubuisi and Ayo Bankole. Also in the lineup of choral groups were the Unilag Chorale, conducted by Dr. Albert Oikelome; and the Mountain Top Chorale, conducted by Aderayo Oyegbade. The concert also attracted musicians from the United States and Ghana, including the young Ghanaian pianist, David Kafui, and Professor John Robison, director of Early Music Ensemble at the University of South Florida. 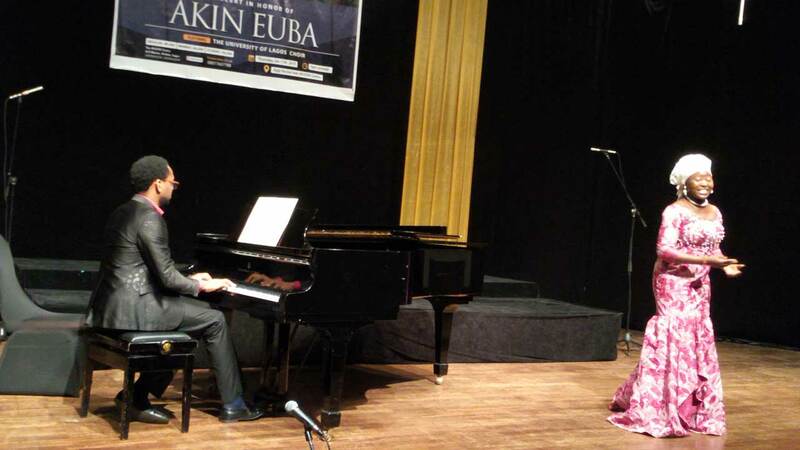 The concert, which had eight of the performed 19 classical pieces, as Euba’s compositions, held at the Agip Recital Hall, MUSON Centre, Onikan, Lagos. The night began with FESTAC Anthem and Virgin Mary had a baby boy by Euba and performed by MUSON Diploma Choir conducted by Sir Emeka Nwokedi. The two evocative choir pieces were followed by Euba’s Five pieces for English horn and piano, which many uninitiated listeners of art music would dismiss as horrible. Seun Owoaje (piano) and Robinson (horn) performed the five pieces. 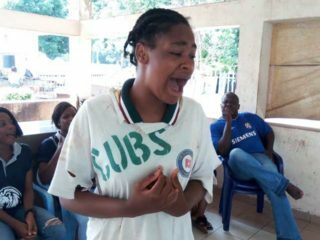 In sharp contrast to the bizarre five pieces, Ranti Ihimoyan lifted the air with her operatic voice, as she performed Euba’s Groove for the master drummer with Adebayo Ayandare on iya ilu, Kangan Opeyemi on omele isaaju, and Owoaje on the piano. Other classical pieces rendered during the evening of quality music and enthralling compositions were Waka duru for piano by Euba and performed by Ayo Bankole Jr; Agidimo dance No. 1 and Prayer composed by Prof. Bode Omojola and performed on the piano by Kafui. The marvelous master drummer (Anthony Merenini), Ya Orule and Rhapsody on an Egun theme composed by Ayo Bankole and performed on the piano by Ayo Bankole Jr also whetted the appetite of art music aficionados. Other songs that followed were, Ayo Oluranti’s Ona Abuja, performed by the baritone singer, Femi Oyesanya, with Owoaje on the piano; Ilu Baje O, rendered by Adedaramola Olaore, with Mofopefoluwa Onalaja on the piano; and Rabata, performed by Mountain Top Chorale conducted by Oyegbade. The MUSON Diploma Choir returned to stage to perform TKE Philips’ Psalm 121: Emi O gbe oju mi soke wonni and Ayo Bankole’s O seun fun mi (from FESTAC Cantata). After Omojola delivered Euba’s message, the soprano voiced Elizabeth Olaitan performed the last three pieces of Euba for the night: Mo Le J’iyan Yo – This is the first piece of a set of six Yoruba songs composed by Euba – Ore Meta and Mo Ja’we gbegbe, all accompanied on the piano by Tosin Ajayi. That the piano featured prominently in the concert was no surprise. Euba is globally known for inventing and theorising the concept of African pianism. Euba has devoted a significant portion of his composing career to exploring how composers could use the Western Pianoforte compositionally to reinterpret the structural and performance features of African music. For Euba, the piano, because of its unique attributes, could be used as a medium for re-interpreting the core structural and rhythmic principles of African music in new ways and for global audiences. 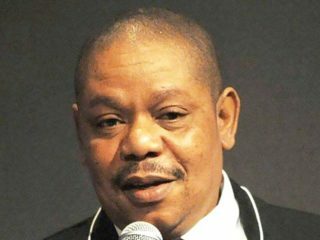 Also, he coined and popularized the term creative ethnomusicology to conceptualise the relationship between ethnographic research and musical composition. Euba’s interest in music began when he was a student at the CMS Grammar School in Lagos. After years of study at the Trinity College of Music in London and the University of California, Los Angeles, Euba returned to Nigeria to start the department of music at the University of Ife (OAU) in 1976. 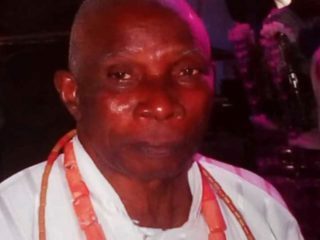 He left Ife for the University of Lagos where he was appointed Director of the Centre for Cultural Studies and Professor of music from 1977 to 1980. A former member of MUSON, Akin Euba has devoted a significant part of his professional career to promoting African modern compositions on the global stage through performances, research and creative work. Euba edited a newsletter, directed a research centre and organised an inter-continental symposium series to explore the significance of interculturalism in musical composition and performance. His works include, numerous acadmic publications and compositions, prominent examples of which are his book, Yoruba Drumming and Chaka, an opera in two chants, which was recorded by the city of Birmingham Touring Opera (UK), conducted by Simon Halsey, in 1999. Euba, who retired in 2011, now lives in the United States of America, where he is Emeritus Andrew Mellon Professor of Music at the University of Pittsburgh.